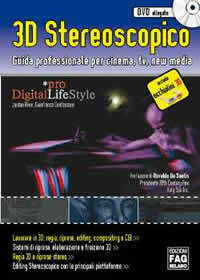 The book describes in detail the techniques and technologies used in stereoscopic 3D. It is divided into two parts, the first is an introduction to the fundamentals and the second is purely practical and deals with directing and shooting 3D stereo, 3D editing, compositing, CGI. The volume includes 3D glasses and a DVD with video files used for the examples.